The Austin Rodeo wraps up this weekend, but a luxury getaway for the equestrian can be found in Texas any time of year. The Inn at Dos Brisas, a Relais & Châteaux property, offers the amenities of an upscale resort in a quaint ranch setting. 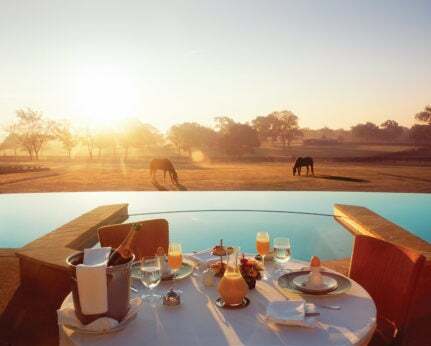 On 313 acres of rolling meadows, The Inn at Dos Brisas provides a rustic atmosphere for guests to let out their inner cowboy or cowgirl in Relais & Châteaux-level luxury. The former family home now includes nine Spanish-style haciendas and casitas to accommodate guests for short and extended stays alike. For the most lavish stay, book one of the 1,795 sq ft haciendas with an additional 1,205 sq ft of outdoor space. The hacienda features a master with king-size bed, bathroom with jetted soaking tub, walk-in shower with rainforest shower head, dressing room, walk-in closet and fireplace. There’s a living room with an additional fireplace for cozying up, plus a dining table, sleeper sofa, writing desk, wet bar area and additional powder room in the foyer. Outside, overlook your own private plunge pool from an enclosed porch with a swinging daybed, or utilize the large outdoor shower for some fresh air. A separate butler’s entrance is perfect for ordering room service from the Inn’s restaurant, but if you’d prefer to get out and explore the property, guests of the hacienda also have access to a personal golf cart. The Inn at Dos Brisas boasts a full equestrian facility, one of the largest in Texas, which is home to a show barn and arena. Guests can embark on a guided trail ride through the foothills of Texas Hill Country or take riding lessons with the Inn’s Clydesdale – you can even bring your own horse to board. 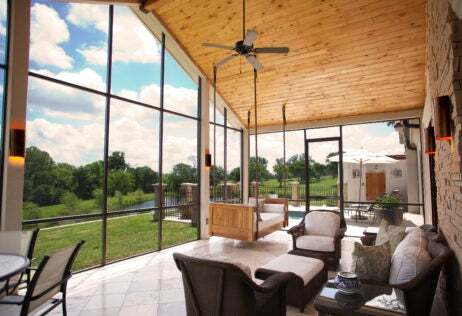 The less horse-savvy can enjoy outdoor activities like clay target shooting, fishing, biking, running, swimming, hunting, golf and tennis on the expansive property. The resort’s award-winning restaurant provides an elegant dining experience in an intimate setting, with ingredients sourced from the Inn’s own organic farm. True farm-to-table dining begins with the 42-acre organic farm on the property, where guests can take gardening lessons and pick their own produce. Cooking, mixology and wine tasting classes are also available to experience. When it’s time to unwind, a spa therapist will come to your hacienda for a poolside massage. End the day with a leisurely walk through the rose garden followed by stargazing from your private patio. The Inn at Dos Brisas is located at 10000 Champion Drive, Washington, TX 77880. For more information, please visit dosbrisas.com.